Nationals is almost upon us on this final season of Glee before everything changes. 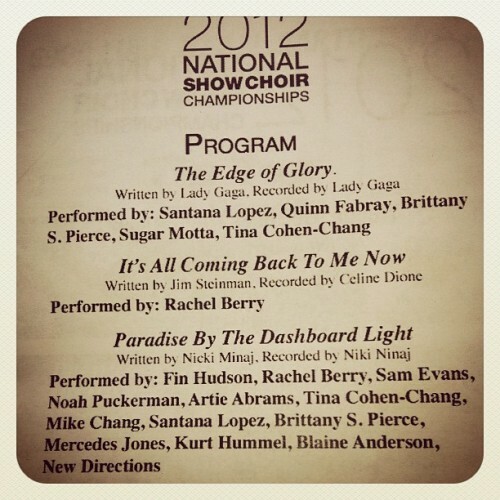 What can we expect New Directions to perform at their final competition together? Some Gaga and some Celine to give you a taste. Check out the setlist after the cut! All of the “Glee” regulars, as well as Rory (Damien McGinty), Joe (Samuel Larsen) and Sam (Chord Overstreet) perform. And we hear that Quinn (Dianna Agron) will be back on her feet dancing! Wade (Alex Newwell) returns to lead that squad, and he sings his performances in drag. The judges at nationals are Perez Hilton, Rex Lee and Lindsay Lohan. Perez and Rex were filmed during the awards ceremony, but Lindsay was noticeably absent. As of publishing time, they’re only halfway through their shooting day, so Lindsay may be shooting her scenes later. How certain are you of this being real? Because there’s a lot of typos and miscredits. Apparently it’s a prop and there are errors every year. From what I’ve read anyways.